In 1960, my long series of wanderings and adventures continued. On one of my U. S. Steel business trips to Minneapolis, I was again invited to dinner at Waring Jones' home. Another guest that evening had been stationed in Hawaii during World War II, and there he had met Edgar Rice Burroughs several times. That was an eventful evening for me. This was the first person I had met in my travels who had actually known Burroughs, and whom I could talk with about him. (Although I had met and talked with J. Allen St. John in 1945, I really had not learned anything about Burroughs from our talks.) I wanted Waring's guest to give me some insight into Burroughs' character, even if it was a second-hand reference. I do not now remember much of our conversation, except that he told me Burroughs was an interesting and talkative person who loved to go to parties. He apparently liked to be with people a lot, but of course, not when he was busy writing. In October of 1960, I was called by the producer of a Pittsburgh radio talk show to be interviewed on his program. I was more than willing to do so. The show was called "Program PM," hosted by John Stewart, from 8:00 to 10:00 p.m. weeknights on KDKA. It was a live interview program. We discussed Burroughs, my collection, and the Burroughs Bibliophiles for about 20 minutes. This program got me started in what I would later call my "show business" career relative to Edgar Rice Burroughs, which would continue for several years as part of my adventurous wanderings. With the formation of the Burroughs Bibliophiles, I became very evangelistic in trying to spread the good words of Burroughs in the Pittsburgh area. I discovered that a display window for hobbies and crafts was made available in the concourse of the Pittsburgh International Airport. After some negotiations with the agency that controlled these windows, and purchasing a special insurance policy to cover the display, I obtained the window for November and December of 1960. I gathered an exhibit of about 20 different items of Tarzan and the Jewels of Opar to put into that display, including the magazine version, the first edition, reprint editions, foreign editions, and the Big-Little Book. A few people called to tell me they saw the exhibit. Some 20 years later, someone in Burroughs fandom (not from Pittsburgh) wrote to me and asked if I was the person who had the exhibit at the airport. He had seen it while passing through the airport. Also in 1960 a local television station, KDKA, began showing the Tarzan films on a weekly basis. To stimulate interest in the programs, the TV station sponsored a "Tarzan Yell Contest" for young fans at a downtown theater, the Fulton. They held it on a Saturday morning in December, with KDKA's Don Riggs as host. They also showed one of the Tarzan films at the theater, but which one I no longer remember. Of course, I had to attend, just to be there and hear what some of the contestants sounded like. Pretty poor imitations! (I didn't attempt to offer my version.) They drew a fair-sized attendance for the contest and movie, so it achieved some publicity for the TV station and for Burroughs. In March and April of 1961 my evangelistic efforts in spreading the good words of Edgar Rice Burroughs took a leap forward. These two "Show business" events included a talk about my hobby, an exhibit from my collection, and films of Elmo Lincoln as Tarzan. During May I was a guest speaker twice on local television. Don Riggs, the host of a live morning show on KDKA, invited me to be interviewed on May 8, to discuss my hobby and to comment on some film clips of my Elmo Lincoln Tarzan of the Apes. Since Don Riggs and I had not met beforehand, I really didn't know what to expect. But it went well. Riggs, as "Bwana Don," also had a Saturday morning show called "Safari," where he showed various jungle films, about half of them "Tarzan." His comments, made during the commercial breaks, were taped ahead of time, on Thursday evenings. after the May 8 success, he invited me to appear on the May 19 Saturday morning show, when he would be showing a Tarzan film. This time, during the Thursday evening taping, I brought along some Tarzan books and movie posters to add to my interview. All of the show business exposure was making me a local neighborhood star -- "Bwana Bob." My fellow workers at U.S. Steel also recognized my star status, but I was able to handle it in my usual humble style. In late June, The Burroughs Bibliophiles held a Dum-Dum in Cincinnati, Ohio during the Mid-West Science-Fiction Convention. Again, Vern Coriell was unable to attend because of his work commitments, and asked me, as the recently elected President, to conduct the meeting. We had no separate banquet nor guest speaker, but enjoyed lively get-togethers of buying, selling, and trading, before and after the Convention Banquet. Considering that the club was so new, there was a good turnout of about 25 members. A Constitution and By-Laws, drawn up by Vice-President Stan Vinson, resulting in a lot of discussion. Eventually, after some changes were made, it was voted on and adapted. Vern later printed the Constitution and By-Laws in Issue No. 1 of the Burroughs Bibliophiles publication, Dum-Dum. The Dum-Dum appeared annually but was discontinued after the fourth issue. I made more stage appearances later that year. In September I gave practically the same talk and film show at a Little League Baseball banquet. In October I spoke to a group at St. Nicholas Church in Homstead, PA, and later, to a group of retired engineers from the American Bridge Divisionof U.S. Steel in Ambridge, PA.
At the time, I wondered how I could turn this into a money-making operation, but never did find a way. In all of these, I wanted to stress that this was my particular hobby, and although working on it took much of my time, it had rewarded me with years of pleasure. But this, I reminded them, was not necessarily the hobby for everyone. I tried to tell the audience that they should examine their inner selves to discover whether some other type of hobby might enrich their lives as this one had enriched mine. I pointed out that there were hundreds of activities that could be developed into rewarding life-long hobbies -- Edgar Rice Burroughs and Tarzan just happened to be mine. Clarence B. Hyde of Pittsburgh will speak and show old "Tarzan" movies during a meeting of Explorer Scout Post 435, sponsored by Aliquippa First United Presbyterian Church, today at 7 p.m. in the church. Explorer scouts from throughout the district will attend the program. Hyde, who has been collecting information on "Tarzan" for the past 25 years, is president of the Burroughs Bibliophiles Club, a world-wide organization of "Tarzan" and Edgar Rice Burroughs fans. The Pittsburgh man currently owns a collection of 350 different editions of the 60 Burroughs' novels on Tarzan. The collection has been displayed at Mellon Bank, Pittsburgh, and at Greater Pittsburgh Airport. He has seen all 27 Tarzan movies filmed since 1932 and three of the eight films before 1932. One of Burroughs' greatest fans, Hyde named his son John Clayton Hyde after the fictional Tarzan's "real name,' John Clayton. Hyde will display some of his collection and project the "Tarzan" films, made in the 1920s. Sunday, April 30, 1961 People collect all sorts of things. Clarence Hyde, a computer expert happens to be interested in Tarzan. He will show part of his collection of "Tarzania" at a joint meeting of the Science Fiction Club and the Jefferson Club at 7:30 o'clock tonight in the First Unitarian Church, Ellsworth and Morewood Avenues, Oakland. Included in the showing will be old silent movies of Tarzan -- starring Elmo Lincoln -- and original comic strips and books and other Edgar Rice Burroughs writings, some of which have been translated into other languages. Mr. Hyde is international president of the Burroughs Bibliophiles, an organization devoted to preserving 'the legendary jungle king of literary history. holds bow from Dad's collection. head of the "Burroughs Bibliophiles"
First Unitarian Church. Every wise woman knows that her husband will be a happier man and stay closer to home if he has a real hobby to ride! But just how does a gal feel about a hubby who rides a hobby elephant or a hobby lion instead of a hobby horse? Alice Hyde can answer that question! She's been married for 10 years to an Edgar Rice Burroughs . . . and that means Tarzan . . .. fan! She says his spare-time "work" has brought lots more fun and interest swinging through the trees into her life as well as his. Her husband, Clarence (Bob) Hyde, senior data processing analyst at the South Side U.S. Steel UNIVAC (think machine) installation, will show his collection of 1920 silent Tarzan films and display part of the collection of books, comic strips and magazines he's accumulated in 25 years this weekend, and she'll be right there watching. He'll speak at a joint meeting of the Science Fiction Club and the Jefferson Club, non-sectarian, interracial business and professional group for men and women 24 to 45, at the First Unitarian Church, corner of Ellsworth and Moreland Aves., Sunday evening at 7:30. Mr. Hyde has been a Tarzan fan as long as he can remember. 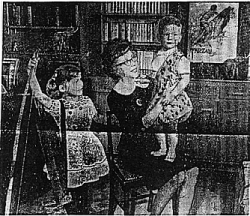 His mother made the ink-spotted "leopardskin" outfit his son John 2 1/2, wears in our picture, soon after Bob read his first Tarzan story. International president of the Burroughs Bibliophiles, a worldwide organization of Burroughs fans, he has collected 350 books, 275 magazines, 300 comic books, 31 years of Sunday color comic strips, parts of 22 years of daily newspaper strips, and 11 early (1918 to 1920) silent movie films. Only event likely to shake up the household is the showing of a late-late or early-early Tarzan movie of any vintage on tv. Alice watches the night shows with him. Wendy, 6, eagerly gets up to catch movies (often shown as early as 8 a.m. on Saturdays) with her Daddy. Bob takes his Burroughs seriously, so there was a slight argument when his wife insisted on naming their new baby girl Susan Jane. He says he's never going to be trapped into saying "Me Daddy, You Jane!" She'll be strictly Susie around home. One of the bonuses being Burroughs fans has brought to the Hydes is their membership in the Science Fiction Club here. It came about when a SF fan saw part of Bob's Hobby collection on display in a window downtown. Among Science Fiction fans, who gather once a month, they've met ornithologists, geologists, artists, journalists, public relations people . . and one authentic SF author and book reviewer . . . in Pittsburgh. The World Science Fiction Convention held here Labor Day weekend brought a dozen internationally famous Science Fiction writers to their doorstep. Dirce (Mrs. Arthur) Archer of Barnesdale Street is president of the group. At the Jefferson Club, the Hydes expect to meet another cross-section of city citizens. Doctors, lawyers, teachers, scientists, business men and women, secretaries, librarians, social workers, newspaper people go there too. I must back-step again in this journal of my wandering tale, returning to an event that occurred in the fall of 1959 and should have been told In Chapter XIX. 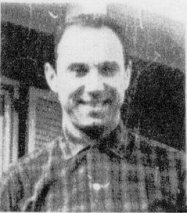 In October 1959 I drove to Newark, New Jersey for a meeting with Allan Howard, one of the great Burroughs fanzine writers, noted for his articles In Vern Coriell's Burroughs Bulletin. I spent three days meeting with him and studying his collection. One evening we attended a lively meeting of the Eastern Science Fiction Associates, where Sam Moskowitz was also in attendance. Sam had some interesting comments on the editing of Burroughs' stories by the editor of Thrilling Adventures, whom Sam knew well. On another evening we visited well-known fan Thomas Gardner in Rutherford, New Jersey, to view his Burroughs collection. After leaving Newark and Allan, I drove over to Staten Island to see John Celardo again, and to watch him doing his artistic work on the Tarzan strips. He was a good friend of Bob Lubbers, and told me where Lubbers lived out on Long Island. So, I called Bob and set up an appointment to visit him the next day. That was a most interesting; visit. He was working on his "Long Sam" strip, and "ghost drawing" for two other strips. I obtained one of his original Tarzan Sunday pages, which he hand-colored for me. Since I had my Sunday-pages-collection book with me to be autographed, he was able to match the colors on the printed page with his hand coloring of the original drawing. That colored original now hangs on the wall of my book room. Now, from 1959, back to the events following Chapter XII. I made plans for a local Dum-Dum at my home for June, 1962. By this time, through my recruiting efforts at work, there were about 30 members of The Burroughs Bibliophiles in the Pittsburgh area. Invitations were sent to about 50 members, some as far away as Akron and Cleveland, Ohio. We had great weather for a back-yard cookout for about 60 people. Back In Chapter VII, I included a copy of the letter from Jack Daley, now one of the "Three from Thuria," that appeared in Amazing Stories for March 1941. I still had not met Jack, although he had joined The Burroughs Bibliophiles in November 1960. 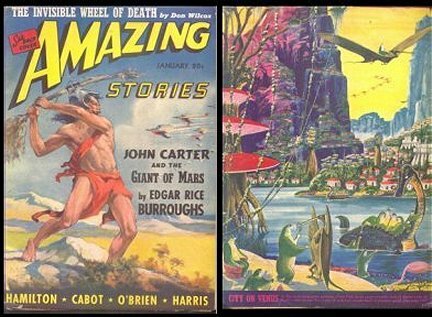 The memory of that letter stayed in a remote corner of my mind, and I believe that someone with that keen insight to analyze "The Giant of Mars," and conclude that Edgar Rice Burroughs had not written it, was someone I would like to know. Jack had not attended the 1960 Organization Meeting of The Burroughs Bibliophiles during our 17th World Science Fiction Convention in Pittsburgh. In checking the telephone book, I found an entry for John Daley listed at the same address as printed in Amazing Stories. So I sent an invitation to my Burroughs gathering. It turned out that Jack didn't live there anymore; that was his father's home. But my invitation was forwarded to Jack, and a reply came back that he would attend. Attend he did, along with his wife Joanne, listed now as Associate Copy Editor of "Three from Thuria." After the afternoon and evening meals, and much talking, I set up a movie projector, and we watched some early Elmo Lincoln Tarzan films, mostly from the "Adventures of Tarzan" serial. Jack and Joanne were the last ones to leave, about 1:00 AM. From that beginning was formed a great friendship, which still exists. I discovered that Jack also was employed by U. S. Steel Corporation, but at a different location (the Applied Research Laboratory In Monroeville) than the one I worked at in Pittsburgh. That friendship grew over many years, to result finally in our joining our other local Burroughs fan, Walter Albert, in this ERB-APA quarterly contribution, and will continue for many years in the future.